Lets re-look at our past ten infographic highlights for the Indian CRE Market. IT Parks and Offices led leasing activity last year in Pune with 65% contribution in absorption. Furnished spaces seemed to be Occupiers choice last year in Pune. 60% of the total deals in 2016 were furnished with average rentals between INR 60-70/sf/month. The year started on a high-note for CRE industry in Mumbai. More than 2.5 msf of space was leased in Q1 2017. Western and Eastern Suburban locations together contributed to nearly 50% of the leasing in first quarter. In Q1 2017, all major southern cities of India – Bangalore, Hyderabad and Chennai, along with Pune had low vacancies. So, all these CRE markets were mostly Landlord Favourable. Noida and Gurgaon were more Occupier Favourable due to high vacancies and more options available to occupiers. Mumbai maintained neutral stance during the quarter with median vacancy levels. Nine micromarkets across top 7 Indian cities recorded leasing activity more than 0.5 msf in the first quarter this year. OMR-I and OMR -II micromarkets in Chennai together contributed to more than 2 msf absorption in a single quarter. Apart from Chennai, both Mumbai and Pune had two micromarkets driving the demand higher than half million. Peripheral South-East market in Bangalore driven by Sarjapur and Central Gurgaon micromarket led by Cybercity – both witnessed more than one million sf leasing in Q1 2017. The Peripheral Business Districts (PBDs) have always been a choice for companies looking for large affordable spaces. Central Business District (CBD) locations – which have been the hub of business activity have mostly been touted as the costliest locations for commercial leasing. 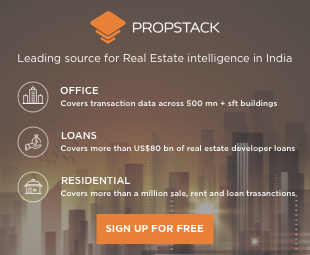 We, at Propstack, tried to compare the rental difference between CBD and PBD micromarkets for 3 major cities of India. Since PBD are also known for large space take-ups, the variance in average deal size between these markets was also analysed. The results were as mentioned below. IT/ITeS sector deals above 100,000 sf added 3.5 msf to leasing activity till date in 2017. 100,000+ sf deals by IT-ITeS sector comprised 55% of the total space leased by such large deals this year. Also, these large IT deals contributed to 40% of total leasing volume in Q1 2017. IT-ITeS companies leased these large offices at an average rental of INR 51.5/sf/month. Small variations in rentals per square foot make a huge difference in monthly rental outflows for a Corporate Occupier. This quarter at Propstack, we observed such a trend within the primary NCR occupier markets of Gurgaon and Noida. Contrary to expectation, the lowest and the highest warmshell rentals for deals signed in Q2 2017 were in the same localities of both Gurgaon micromarkets. In Noida, the variation of maximum from minimum warmshell rental was nearly 36%. Both deals however were in different sectors (Sector 127 and Sector 135 respectively). Propstack analysed the contribution of PBD markets to the total city inventory and vacant space across top 7 cities. Bangalore has the highest inventory contribution from PBD location. With more than 80% inventory and greater than 90% of vacant area in PBD markets, it can be deduced that the CRE industry for this city is majorly concentrated and focused in PBD locations. Hyderabad PBD’s contribution to the overall CRE city level dynamics can be currently considered negligible with suburban locations driving the city growth. Hyderabad PBD locations will take some time to match-up to the demand in other cities. Inventory is the total quantum of existing building stock. We, at Propstack, compared Grade A office stock across the top 7 cities in India to assess the micromarkets with highest inventory levels. Except Chennai, all other top cities had atleast one micromarket in the list of top 10 micromarkets pan- India inventory-wise. Rest of Gurgaon micromarket with in-demand locations like Golf Course Extension Road, Sohna Road, Udyog Vihar, etc. has the highest inventory of 44.6 msf. India has seen a surge in Private Equity investments in the recent years. Leading global private equity funds have invested in trophy commercial real estate assets across top cities of India to reap benefits of attractive yields. 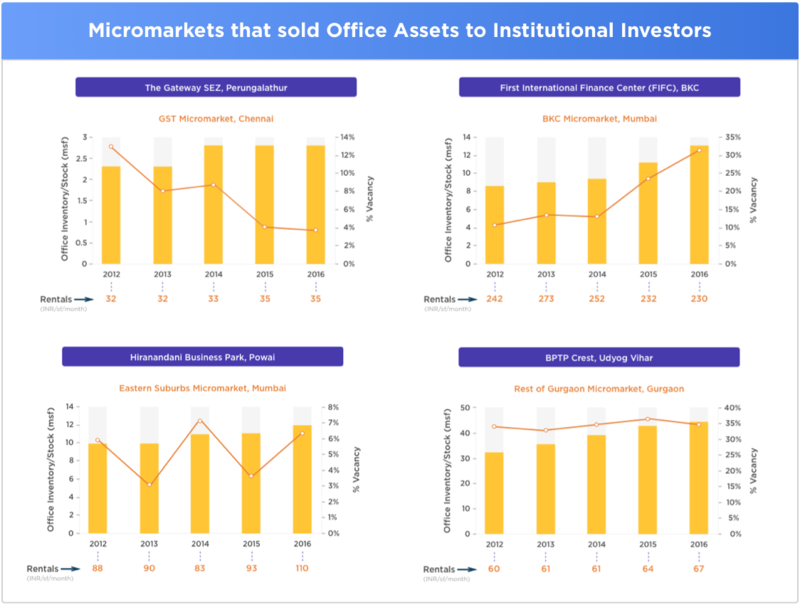 We, at Propstack, looked at the historical performance of some of the micromarkets where the properties acquired by these institutional investors are located. The analysis is presented below.